@shmookles - Thanks for helping with testing and criticism. No new features are currently in the works. There are many automation's built-in to NST Manager. This makes setup and management much simpler as they are integrated both into NST Manager and with each other. Note: Multiple SmartApps may simultaneously use NST Manager device handlers, as the devices handlers comply with SmartThings Device Capabilities. Heads Up: It is important to consider "who is on first" in regards to setting up automations. This includes schedules and automations built into Nest itself, other Nest Aware Integrations, as well as SmartThings automations. Typically with this automation, configure its options to have it set thermostats to ECO settings when AWAY, and return to normal operations when HOME. Time, ST mode, HVAC state restrictions can be set to restrict operations. The sole function of this automation is send notifications when errors or safety settings are reached. This automation has many features that can be individually enabled: (Fan Control, External Temp, Humidifier Control, Schedules, Remote Sensor, Contact Watcher, Leak Watcher). If schedules are setup/enabled (Schedule Automation below), all features that are enabled for this Nest Thermostat share the schedule set points. When Nest thermostats are set to ECO (or OFF), temperature settings cannot be adjusted by SmartThings automation's. It is important that ECO temperature settings are properly set up in each configured Nest thermostat in Nest mobile app or Nest Web site. NOTICE: Nest thermostats have built-in safety temperatures. These should be properly set on each thermostat to ensure full protection in Nest mobile app or Nest Web site. The schedule precedence is the first schedule that is not restricted (i.e. the schedules are evaluated in order 1,2,3,4) and the first schedule whose restrictions match current state is set as the *active* schedule. 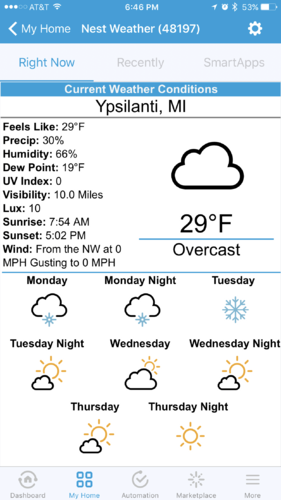 For a Schedule to become active, it MUST always have Temperature set-points configured. Switch is required to be ON to make schedule Active. Motion override settings include HVAC Mode, Temperature set-points. Because the schedules did not fill in HVAC Modes, We will use the current HVAC Mode that the thermostat is in at the time the automation runs. HVAC mode can be defined in a schedule (for example one of HEAT, COOL, or AUTO) to have the automation set that HVAC mode then set the temperature setpoints. If the thermostat is OFF when the schedule is evaluated (schedule without HVAC mode set in the schedule), the HVAC system will stay OFF as in the example above the schedules are not configured to change HVAC mode. The schedule "will be active", but it will not adjust setpoints as the current HVAC mode (OFF) does not allow temp changes. If the HVAC mode is ECO when the schedule is evaluated (or the schedule sets the HVAC mode to ECO), the temperature settings of the schedule are "ignored", as a Nest thermostat in HVAC mode ECO (like OFF), adjustments to the temperature settings cannot be made. If the thermostat comes out of ECO mode (for example Nest Mode automation above or some other automation or user operation), the schedule would be re-evaluated and the temperature settings will take effect. In the example above Schedule 3 is the "catch-all" schedule if none of the other schedules matched. So if the ST Mode went from DAYTIME -> VACATION, or NIGHTTIME -> VACATION, the first two schedules would not match. Having a catchall without any time/mode restrictions LAST makes it clear that some schedule matches. NOTICE: If schedule 3 was first in the list, it would ALWAYS match, and the schedule would set the zone to 65 degrees when the automation runs. SCHEDULE ORDER MATTERS! NOTE: The more advanced schedules will have more parameters and/or overrides. Additional settings include motion sensors and temperature settings to use if the schedule is active when motion is detected. When using Remote Sensor automation (below), there are settings to allow adjusting which temperature sensors are used when a schedule is active, etc. It is not required to fill in these additional parameters unless the automation "plan/desires" requires them. The same basic rules apply - the first schedule that matches the schedule restrictions is the active schedule. Remote Sensors are commonly used to deal with temperature differences within a thermostat zone that may cause occupants to feel uncomfortable. By adding or using different temperature readings within the zone, this automation can change HVAC operation to make the zone more comfortable. This automation also allows for the creation of larger "zones" by joining together different zones. 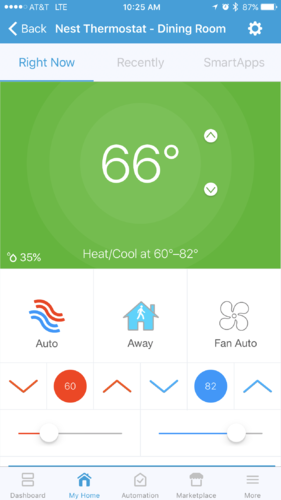 Creating a virtual thermostat for the remote sensor automation makes it easier to see and adjust the zone's temperatures via the SmartThings mobile application or other SmartApps. Note: Nest has added for newer model thermostats, the ability to have additional room temperature sensors (from Nest) integrated with a thermostat. 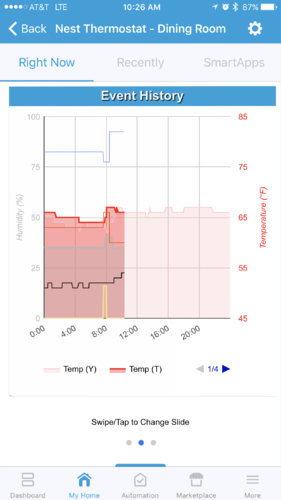 Currently, there is no integration of these additional Nest temperature sensors with the Nest API (and so no ability to see these sensors in NST manager). It is important additional sensors you use report temperature changes within "a reasonable timeframe". If the sensor reports very infrequently, this can cause the automation to overshoot/undershoot. Automation schedules can override alternate temperature sensors used by Remote Sensor automation to allow for different temperature measurements based on the schedule. This automation allows the creation of a virtual thermostat in SmartThings, to allow users (via SmartThings App) or other automation's to see and adjust the set points in use on the "remote sensor thermostat". 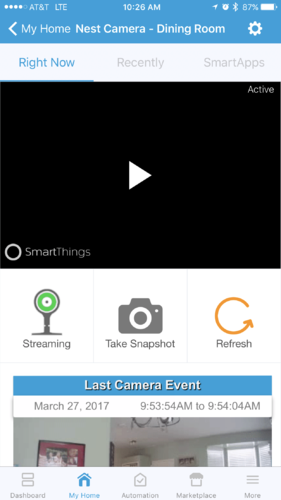 This is not required to use the remote sensor but makes it much easier to see the operating settings remote sensor is using and integrate with other SmartThings automation's. Because the temperature sensor is commonly not the Nest Thermostat temperature reading, this automation adjusts the thermostat set point higher / lower to force the HVAC system on/off. This can cause confusion when one looks at the physical thermostat (or thru the native Nest Mobile App or Nest Web access), in that the set points can seem artificially high or low both during operation and off times. If one looks at the virtual thermostat settings will appear "normal" or "as expected". This is done because the relationship of the physical thermostat to the remote sensors in use at this time is not "fixed" or "constant". The settings on the physical thermostat are "forcing on" or "forcing off" the HVAC system based on the automation's temperature measurements. Temperature settings are done on the virtual thermostat (either manually, or via another SmartApp) override the schedule in NST Manager for 4 hours, or until the next schedule change - whichever occurs first. The temperature setting entered when configuring remote sensor, are the "last default" or "last resort" temperature settings that will be used if no schedule matches (see Schedules above). If any monitored water sensors become WET, the automation will turn off the HVAC unit (connected to this thermostat) until all water sensors return to a dry state. If any monitored contact sensors become open, the automation will set the HVAC unit to ECO (connected to this thermostat) until all contact sensors return to the closed state. This automation will only return the system from ECO if it set the system to ECO. This is commonly used to save energy. This automation typically relies on the Weather device handler be enabled in NST Manager. It can be configured to use an external temperature sensor installed at the location (however dewpoint checks will not be available). This automation considers inside temperature, external temperature, and dewpoint, and will change to eco if the inside temperature is within a threshold of the desired setpoint. Time, ST mode, or HVAC state restrictions can be set to restrict operations. This automation typically relies on the Weather device handler be enabled in NST Manager. It can be configured to use an external temperature sensor installed at the location. This automation will set the switch on to call for humidification, and off when the humidity level is reached/exceeded. Device Handlers are installed via the IDE (see installation instructions below) and are created when configuring the NST Manager application. These are the devices handlers for the physical Nest devices such as a thermostat, protect, camera, and there are virtual device handlers that can be created for Weather, Presence, and virtual thermostats. One thermostat device will be created for each thermostat at a Nest location. One protect device will be created for each protect at a Nest location. Battery reporting capabilities to monitor battery status. 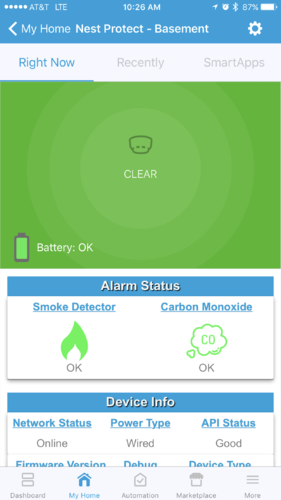 Supports testing in the DTH smoke and CO2 alerts for testing automations in SmartThings. One camera device will be created for each Nest Camera at a Nest location. 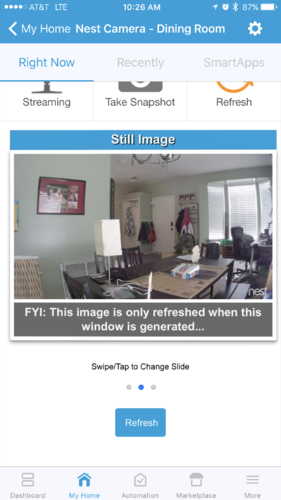 Note sound and motion sensor reports from Nest are delayed by Nest until after the event has finished and are only received after 1-3min polling window. 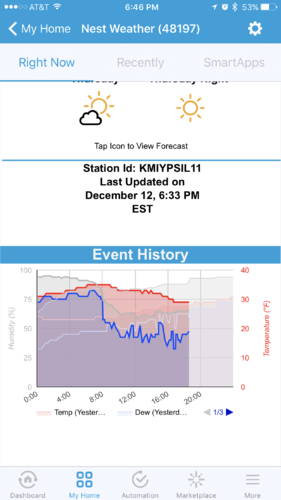 This virtual device gathers weather data from Weather Underground and provides SmartThings access to this weather data. It can be used by External Temperature Sensor automation (below) or Humidifier automation to monitor external temperatures and dewpoints. Other applications can use it also, as it is compatible with Smart Weather Tile capabilities. 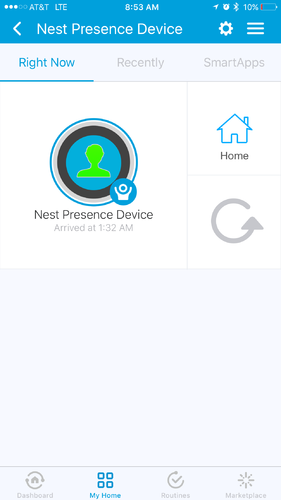 This device allows provides Nest Locations Home/Away status as a virtual presence sensor for in any routine or SmartApp that supports the presence sensor capability. This device is the same code and has all of the same features as the thermostat above. With the exception that it can only be created when configuring Remote Sensor automation. The virtual device can be used to provide easy control of the new virtual zone that is created by enabling the remote sensor automation. Please ensure if upgrading, to closely follow the upgrade instructions in this document. When upgrading an installation running versions prior to V4.0 it is required to delete all built-in automations prior to upgrade and re-create them after the upgrade is complete. Each install of this SmartApp will only support One location/structure and the Thermostats, Protects and Cameras within the Nest structure. If multiple SmartThings Locations are configured, NST Manager would be installed in each SmartThings location (if there are Nest devices in each location). 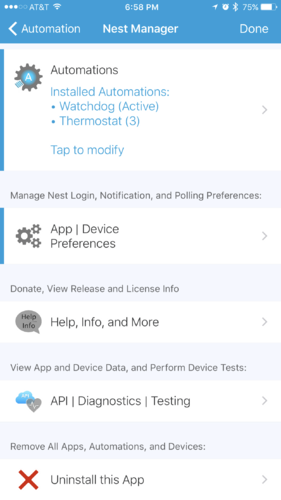 In the Nest mobile application, permission updates may need to updated for ST NST Manager in the "Works with Nest" section under "Account" -> "Works with Nest" -> "ST-Integration", to ensure the latest Nest features are integrated with NST Manager. 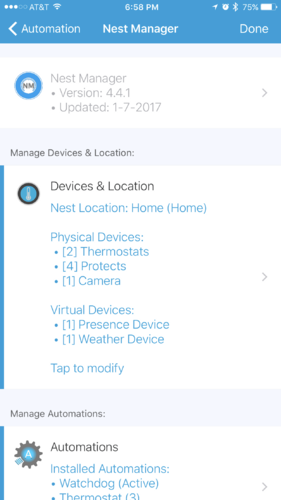 If in the Nest Mobile app, you see multiple ST-Integration under Account -> Works with Nest, and you do not have multiple Nest Locations, you should delete the all the ST-Integration items, and then go into the SmartThings Mobile app -> Nest Manager and re-authorize Nest Manager. When logging into the IDE (to install or gather IDE "Live Logging", ensure to log in to the proper shard. 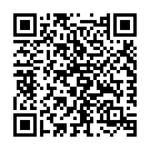 We suggest using https://consigliere-regional.api.smartthings.com/ as it will redirect to the proper shard. If NST Manager is installed in the wrong shard, NST Manager will not show up in the mobile app as available to be configured. For folks using Celsius temperature settings, there is an optional step to perform during install/upgrade to ensure UIs for the thermostat and weather device appear correctly. This is due to an ST limitation that background colors and enums cannot be changed after compile-time for device handlers. 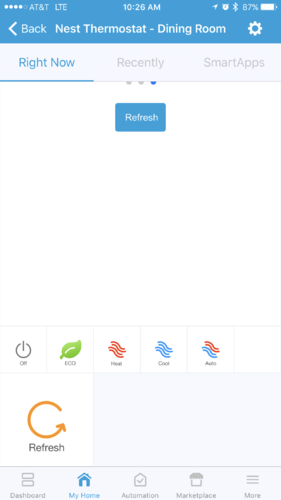 Devices that use HTML tile (thermostat, weather) will not refresh the HTML portions without going out of the device and back in again when in the SmartThings mobile app. Device names can be edited in multiple locations: NST Manager, in the device handler settings page, and in the SmartThings IDE. NST Manager by default will manage/override these settings. This can be disabled in NST Manager Device Customization. Nest mode "eco" is interesting in relation to SmartThings and SmartApps. 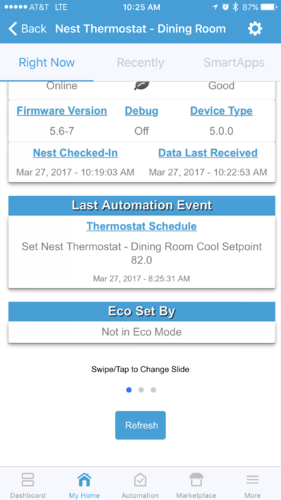 SmartThings thermostat capabilities http://docs.smartthings.com/en/latest/capabilities-reference.html#thermostat has been updated to allow eco as a setting (previously only allows off, heat, cool, auto, emergency-heat as settings). If you are running the latest versions of NST Manager, you can typically ignore the rest of the subsection. if using WebCore or other SmartApp that is normalized to ST capabilities, there will not be a standard command to set eco mode. Create a "custom" or device specific command in WebCore to call eco(). If this is done, when setting the thermostat back to auto (or heat, cool), WebCore's command optimization will look at the ST view of status, and if what is being set is the same, it will not send the command to the device to come out of ECO. This can be resolved for that piston by setting "Disable Command Optimizations" to ON. This ensures WebCore issues the command even if it "thinks" the device is in that state. The thermostat device does support a custom attribute "nestThermostatMode" which shows ECO state in addition to the standard ST capabilities states. Nest protects report battery status binary (good/bad), there will not be a gradual battery drop visible (SmartThings reports battery level as a percent). Key is when in ECO, (and commonly AWAY) mode, temperature settings cannot be changed on the thermostat until the thermostat is taken out of ECO mode. in other SmartApps, create custom commands for home() and present() and call these based on automation needs. These commands are in the thermostat device, The virtual presence sensor device uses the API setPresence() to toggle home/away. Nest Home/Away Assist has been challenging since the changes adding ECO mode by Nest. Many users experience the home randomly coming out of away mode (and therefore out of ECO mode if home / away assist is enabled) https://community.smartthings.com/t/removed-nest-manager-4-0/60052/418. This issue has been reported to Nest. Some have suggested that Nest seems to do this on some Nest schedule changes. NestMode Automation (described above) can automate setting nest to eco when it sets Nest AWAY, and setting back to ON when setting Nest to HOME. If this feature of NestMode automation is enabled, consider what other automations are also adjusting Nest Home/Away on a thermostat. Nest rate limits command's to their APIs based on devices and structures. This is done to ensure the availability of their services, and do not impact the operation of the devices. Writes (changes of temps or modes) to Nest devices requires the device to wake up and synchronize its state. This can impact battery life so Nest implemented rate limits. It is important when designing automation(s) using Nest, that automation(s) do not require more changes than Nest will allow in a period of time. NST Manager for SmartThings implements throttling to try to keep requests within Nest’s rate limits. If commands are received for a device that exceeds the Nest rate limits, the NST Manager will slow the commands to 1 per minute for the device that is over the limit. Having multiple automations trying to adjust the same parameters, or constantly changing parameters is common way to run into Nest's rate limits. Nest may reject commands if the battery state of the Nest device is low. If this occurs, Nest will not accept any commands for the device. Nest does not give us any direct access to the status of the motion sensor. They only may update home / away - based on Home / Away Assist. We cannot see from their API the motion sensor status for Thermostats or Protects. 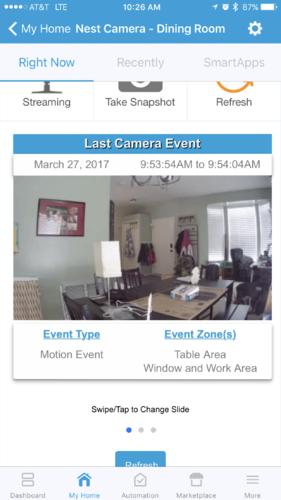 Some motion capabilities are available with the NestCam, however, the Nest API reports these *after* the event has ended. Nest does not give us API access to set humidity. Some folks have used old Nest drivers to allow this, not using approved Nest APIs. 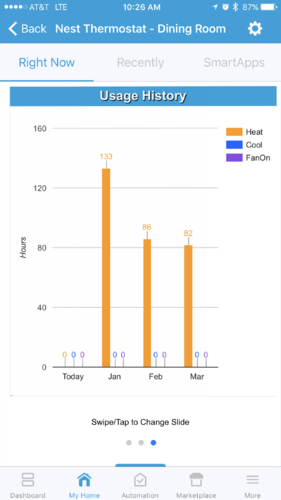 https://github.com/jdc0730/device-type.nest-humidity. 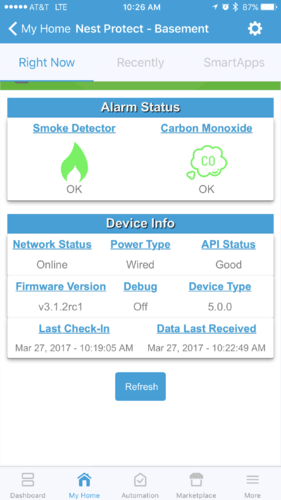 Nest does not provide API access to components of the smoke/CO2 detector. Nest API does not give us access to schedule settings/times, so we cannot "see them" to use, or modify them. 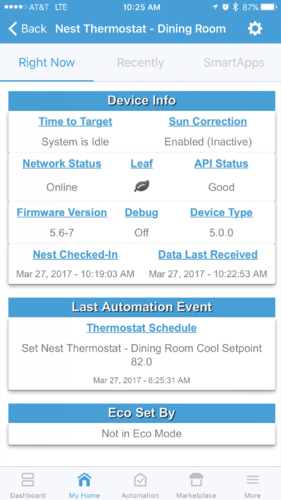 Related to this is asks for us to be able to "resume" current Nest schedule; Nest does not offer a resume command for temperature overrides, beyond the next "schedule change time"
NST Manager devices follow SmartThings Thermostat, smoke / CO2 detector, Camera, Weather device type capabilities. These should work fine with all SmartApps that support thermostat, smoke detector, camera, or weather capabilities. 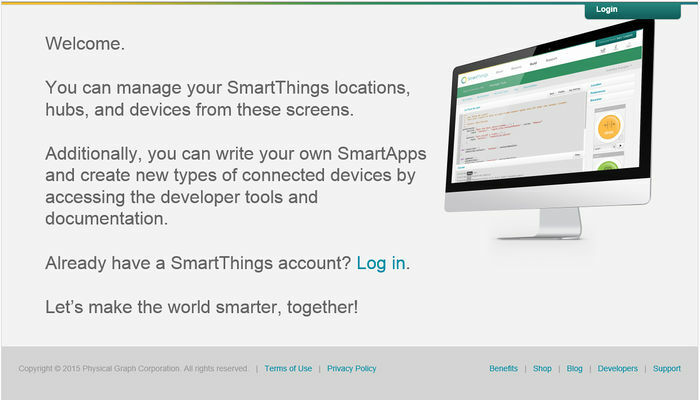 Point a browser to the SmartThings IDE and Log In with your primary SmartThings login. NOTICE: In the past we provided you with our developer id and secret built-in to help you generate your own Nest Tokens just by signing in, but as time went on and our user base grew (+7300) we started to have to constantly create accounts to get new ids and secrets for 50 users at a time. We tried to get an official certified by Nest but they wanted us to neuter our App's and Devices in exchange for increasing our user limit so I decided it's time to ask users to start creating their own. We will continue to allow using our tokens but if you receive an `Unable to Authorize Works with Nest` message after you try to log in then you should create your own account and use your own ID and secret going forward. Here is the page I created to help walk you through all the settings and required description text to quickly create a Nest Product to use with NST Manager. Thanks, @WB70 for taking my crappy instructions and making them useful. Enabling the GitHub Integration in the IDE is by far the easiest way to install and get the latest updates for NST Manager, Automations, Presence, Protect, Thermostat, and Weather devices. Clicking this button will open the GitHub Repository Integration page. 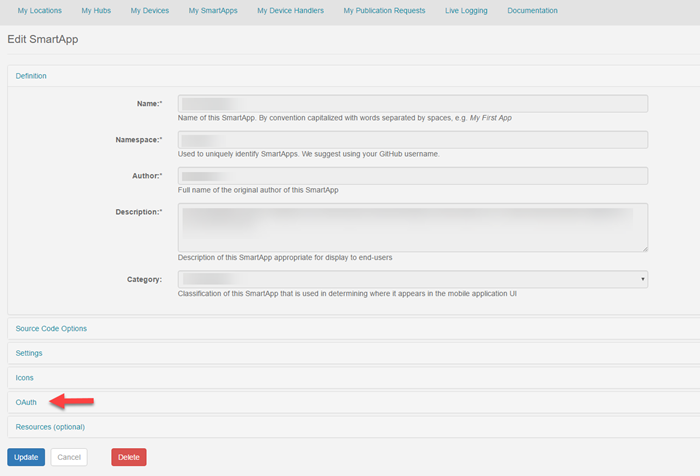 Check the Publish box and Click the Execute Update in the bottom-right corner of the screen. When done syncing, the new apps should now appear in the IDE. If they ever change color, that indicates a new version is available. That's it in the IDE... Just install "NST Manager" from the Marketplace > MyApps under the mobile app. When updates are available to the source code the Link color change from black in the IDE. While on the GitHub site, find the Raw button and click it. This will bring up a non-formatted page with just the code present. Point a browser to the SmartThings IDE and Log In. Once logged in, find the My SmartApps link on the top of the page. Clicking My SmartApps will allow creating a new SmartApp. Since the code in the clipboard, find the tab along the top section called From Code. Click Create in the bottom left corner of the page. This will bring up another page, with the code now formatted within the IDE. If the code was copied correctly, there are no other steps except to save and publish the code. In the upper right corner of the page, find and click Save. Now, click Publish (For Me). There should receive a confirmation on screen that the code has been published successfully. Repeat the steps above for the NST Automations App. Just use the same steps as above except click on "My Devices" and then "+ New Device" and copy paste the code for each device listed below. FYI: It is recommended to install all of the device handlers below even if all devices are not present / in use - as we check that they are present to avoid later configuration issues as new devices are added in NST Manager. NST Manager requires OAuth to operate correctly. To enable OAuth, In the IDE, "My SmartApps" -> NST Manager" -> find and click the App Settings button in the upper right corner of the page. Clicking the OAuth link will reveal a button labeled Enable OAuth in Smart App. Click this button. The screen will update giving a unique code for the Client ID and Client Secret. These are the foundations of the security and should be kept secret. This setup is done once and automatically filled in, it is not required to memorize or write down these codes. The final step is to press the Update button at the bottom left corner of the screen or go back to the code by using the button in the upper-right region of the page, then Save, then Publish the SmartApp again. Due to changes to our GitHub repo structure for v5.x.x users with versions v3.x.x or lower will likely have broken installs. Please DO NOT attempt to update from v3.x.x or lower to v5.x.x. These upgrades haven't been tested and will not be supported. We have seen a few users that did not properly update from V3 to V4 (this upgrade required automations to be deleted and re-created in V4). If earlier updates were not performed properly, the upgrade from V4.5.x to V5 will not work. IMPORTANT NOTE: The update to version 5.0 requires using the separated automations file. If there are existing automations it's imperative to install the new automations file alongside the manager file then update all device handlers. The new manager will begin a migration process for exist automations which will back them up and restore them under the new file and remove the old automations. There is no user interaction required beyond updating the files themselves properly. Once the Update from Repo page is shown look under the left column titled Obsolete (updated on GitHub) check the box(es) next to (SmartApp or All of Device Handlers) that show an update. Please NOTE: If updating an install from v4.5.x to v5.0.0 then please check the box next to the new nst-automations.groovy file and nst-storags.groovy file in the New (only in GitHub) box to the right. Once selected the necessary items check the publish box at the bottom right of the page. Congratulation's, done in the IDE. The SmartApps and Devices are up to date. FYI: These steps must be performed under My Devices and My SmartApps respectively in order to update the manager, automations and each of the device handlers. If Git Integration is not enabled or it's not available in the SmartThings region, copy/paste the code from the source links above into each app/device and press Save then Publish for me. ensure the location is correct, and hit "Done"
Go to "Marketplace" and select "SmartApps" tab. Scroll to the bottom of the list, select "My Apps"
Select "NST Manager" from the list. Enter Nest Login credentials when prompted. After initial setup of NST Manager and devices, setup is complete. Optionally enable/configure automations in NST Manager or other SmartApps. 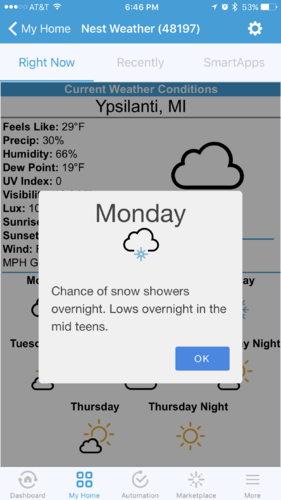 It is important when changing parameters in the ST mobile app to hit "Done" for the parameters to take effect. Hitting the back button may cause settings to not be properly applied. If you change anything, hit "Done" all "the way out". Notifications send message(s) when a certain action occurs. 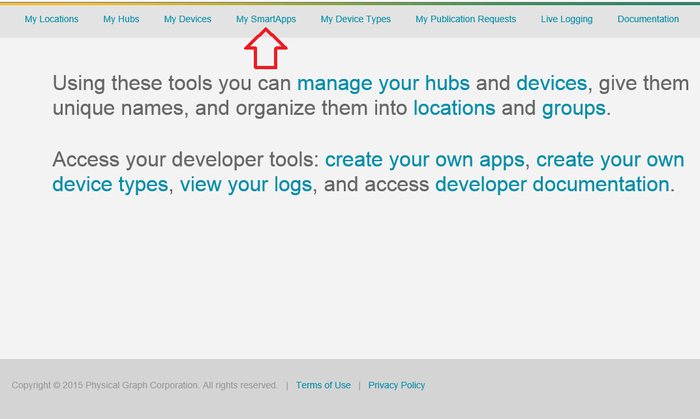 You can ask for assistance in the SmartThings forum. A lot of members of the community use this integration (over 8000 installs) and are generous in their time and assistance. For issues, please let us know by heading over to project's issues page on GitHub. If the issue is not reported please help us improve by opening a new issue and provide as much detail as possible. IDE logs are appreciated. Device handlers with HTML content won't reload under Android client. This issue is being addressed by ST and an issue has been opened with the Android developer. 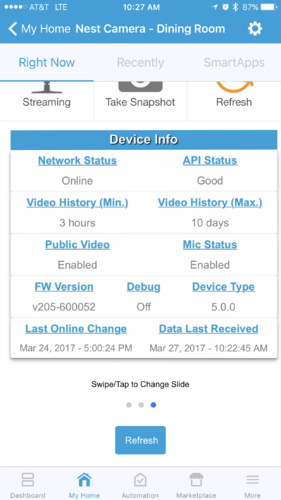 SmartThings health status shows device offline. Going into the device in the SmartThings mobile app, hit settings (gear is upper right) and hit done. This should reset the health status. Verify the software is the most current SmartApps and Device handlers code. Review installation and configuration instructions for items that may not have been followed. Please NOTE nest token instructions and follow carefully. Try to perform actions with the Nest devices in the SmartThings Mobile app (NST Manager, or another SmartApp), and look out for any warnings and/or error messages. NOTE: If you see 401 status errors in the IDE logs, these are authentication issues; revoke and re-enable the Nest Token in the NST Manager App. We love new ideas so please head on over to GitHub and open an issue for the feature. This will help prioritize what is important and what is not. While donations are not required they are very much appreciated. This page was last edited on 17 April 2019, at 15:11.